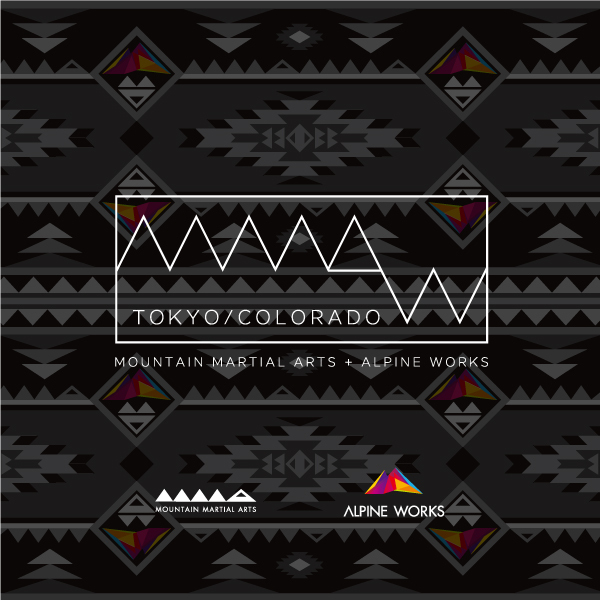 Mountain Martial Arts will be starting a new line ”MMAW” with ”ALPINE WORKS” which is the label of an American trail runner, Joe Grant. Being an outstanding athlete, Joe Grant lives in Colorado which is surrounded by great nature. He is adapting variety of activity such as trail running in his life style. Taking the stance and seeing his activities as culture, Joe is transmitting his philosophy in his own sight ALPINE WORKS and many trail runners are influenced by his philosophy. The concept of MMAW started when Joe came to Japan for an event and met with Yuichi Shibui, the director of MMA. MMA designs and move on to production with the theme ”the life style that connect the town and nature seamlessly”, which Joe suggest. Through trail running, runners of Colorado and Tokyo cooperate to make in a shape. Strangely, the place each runners live are symbolized with the theme ”the town and nature”which is the theme of MMAW, ”TOKYO/COLORADO” is used in the logo. The items are based on the monotone that gives the image of town, and based on natural colors that gives the image of nature. MMA always would like to support many people to enjoy their activities. Even though we hold exhibition with the seasonal concept, we get down to working with the feeling of each other that we want to make.